I approached this disc with some misgiving about the programme. Who wants a recording of four of Holst's Planets coupled with Shostakovich's Festival Overture and Thomas Wilson's Violin Concerto? I do. Having heard the performances, I do. This is a gem of a disc. And let it be said at once that the playing and conducting is extremely good. Christopher Seaman is a fine conductor with excellent insight. I recall the distinguished pianist Peter Katin telling me that in his fifty years on the concert platform he found no better conductor. Thomas Wilson's Violin Concerto is a beautiful work, a piece of lyrical sensitivity. It is almost sensual and many human emotions are here. What is also immensely satisfying is its logical musical coherence, its evident and sound structure, its lack of sickly sentiment and its elegant melodic and harmonic invention. When one considers that the work's inspiration was the late Bryden Thomson one can appreciate the work even more. It being a willing labour of love. The clarity that 'Jack' Thomson brought to his conducting and his concentration on detail and balance is inherent in this masterwork. It has an elegiac serenity that is profoundly moving. It is a work from the heart and to the heart of all who appreciate music of such rare quality as this. Kovacic makes an impressive soloist and shows that his heart, as well as his exceptional ability, is in the piece as well. The Shostakovich is a difficult work to bring off successfully but this is the best recording I have encountered for a long time. The movements from The Planets are played well with a bright sound. 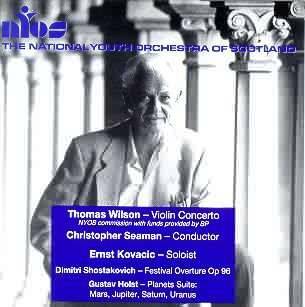 However strange the coupling, this disc should be snapped up because of a truly superb Violin Concerto. Only the ignorant will fail to respond to this exceptional work.